Penn State University Police’s newest member comes to University Park from Budapest by way of western Pennsylvania. He also walks his patrol on four legs, gets paid in playtime, and is a very good boy. Roni, a 2-year-old Belgian Malinois and German Shepherd mix, and his handler, Officer Phil Peng, completed the 12-week Pennsylvania State Police Explosive Detection Canine Handler course in Hershey last month and since then have been patrolling and continuing training on campus. The 12-week state police course gives classroom instruction and field training before a comprehensive final exam. Peng and Roni are now certified in explosive detection, including evidence recovery for firearms and shell casings. For Peng, who has been with University Police for almost two years, the opportunity to work with Roni and join the K-9 unit was one he couldn’t pass up. 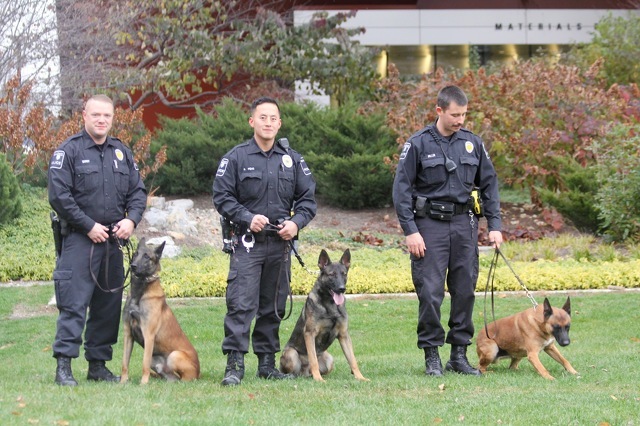 Peng and Roni are the third handler and dog team in the department’s K-9 unit, joining Officer Dustin Miller and Rudie and Officer Josh Quimby and Wail. Penn State Police first established a K-9 unit in the 1990s, and Lt. Matt White, who supervises the unit, said police dogs play an important role for the department and in assisting other agencies. The department purchased Roni from Shallow Creek Kennels in Sharpsville, which specializes in importing and training police dogs. Peng said Shallow Creek searches around the world for the right dogs and found Roni in Hungary. In turn, Roni was just the right dog for Penn State Police. “We looked for high drive, which he has,” Peng said. Peng and Roni spend everyday together, at work and at home. On a typical day, they go out on normal patrols or they continue training to ensure Roni remains acclimated to his handler. Outside of the Millennium Science Building on Wednesday, Roni played with and fetched a stick from Peng, but it wasn’t the usual leisure of an owner and pet. The stick is Roni’s reward for a job well done. By necessity of Roni’s training and job, that carries over at home. He doesn’t snuggle up on the couch with Peng, but he gets love and praise then spends time in his kennel.